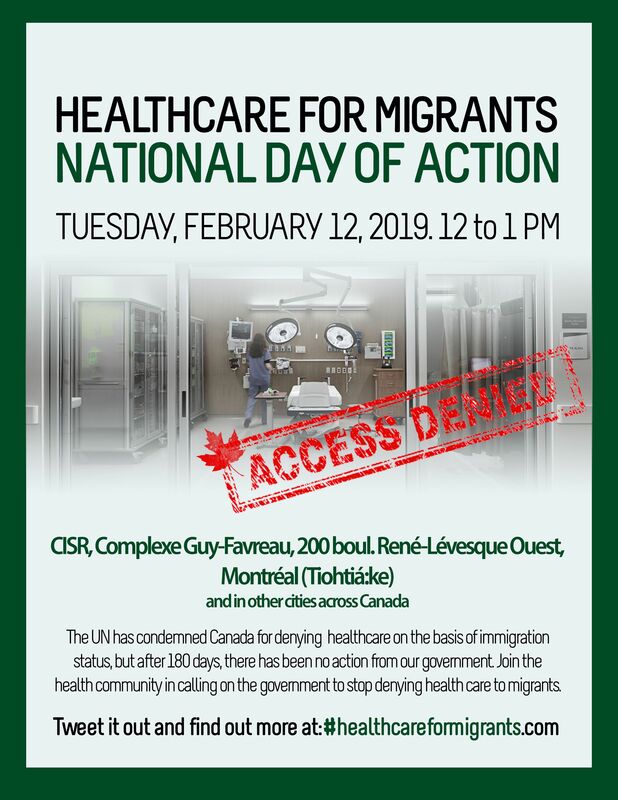 Join us for rallies across Canada on February 12th as the health community calls on the federal government to stop the denial of healthcare on the basis of immigration status! This summer, the United Nations Human Rights Committee (UNHRC) issued a landmark decision condemning Canada for denying access to essential health care on the basis of immigration status based on the case of Nell Toussaint. In light of this UN decision, over 1500 individuals and 80 organizations have signed onto an open letter addressed to the federal government, leading to widespread media coverage. You can read and sign the letter at healthcareformigrants.com. The UN has given Canada 180 days – until February 9th – to report on a review of national legislation, “to ensure that irregular migrants have access to essential health care to prevent a reasonably foreseeable risk that can result in loss of life.” The Canadian government has thus far failed to take any action on this issue. As healthcare workers and advocates for access to healthcare services for everyone living in Canada, we are appalled by the details of Nell’s case and existing policies that place the health and lives of hundreds of thousands unnecessarily at risk. 1. Comply with the UNHRC’s order to review existing laws and policies regarding health care coverage for “irregular migrants”. 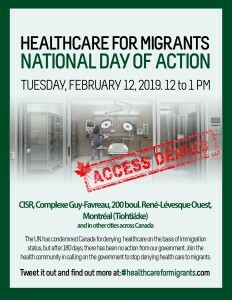 If you can’t be present at the rally, you can still contribute by raising awareness amongst your colleagues and the general population by putting up posters of the event, setting up an information table at your workplace on the day of, and sharing on social media (addressed to @JustinTrudeau @CDNMinHealth @HonAhmedHussen, and using hashtags #HealthCareForMigrants #cdnpoli #cdnhealth #SantéMigrantEs).